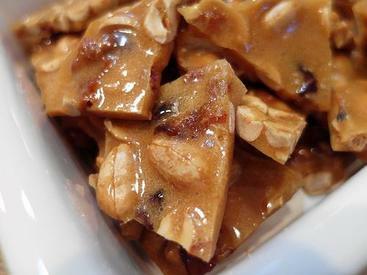 Hard cider peanut brittle with maple and bacon! Dry hard cider, maple syrup and bacon perfectly complement each other in this smoky and ridiculously More-ish peanut brittle. This is the Bacon way to celebrate National Peanut Day! Line a half-sheet pan with Silpat or spray it well with pan spray. Set aside on a heat-proof surface. In a 3 quart, heavy bottomed sauce pan, heat up the sugar, corn syrup, maple syrup, salt and hard cider. Before it gets too hot, taste for salt and add a bit more if necessary. When the mixture comes to a boil, put the lid on and let it boil for 2 minutes or so to wash any errant sugar crystals off the sides of the pan. Remove the lid and continue to cook until the candy reaches 265F. Stir in the nuts and butter and keep cooking, stirring frequently but gently, until the candy reaches 315F. Immediately remove from the heat and thoroughly stir in the crumbled bacon and the baking soda. The candy will foam up and look like peanut shaving cream. That’s just fine. Pour/scrape out onto your prepared pan and smooth out the top with a heat-proof spatula. Cool completely and then break into Reasonable Pieces. You decide what that means. Next time I make this, I will probably increase the maple syrup to 8 oz and leave out the corn syrup altogether.